extracted: Coticule Mine at Regné. 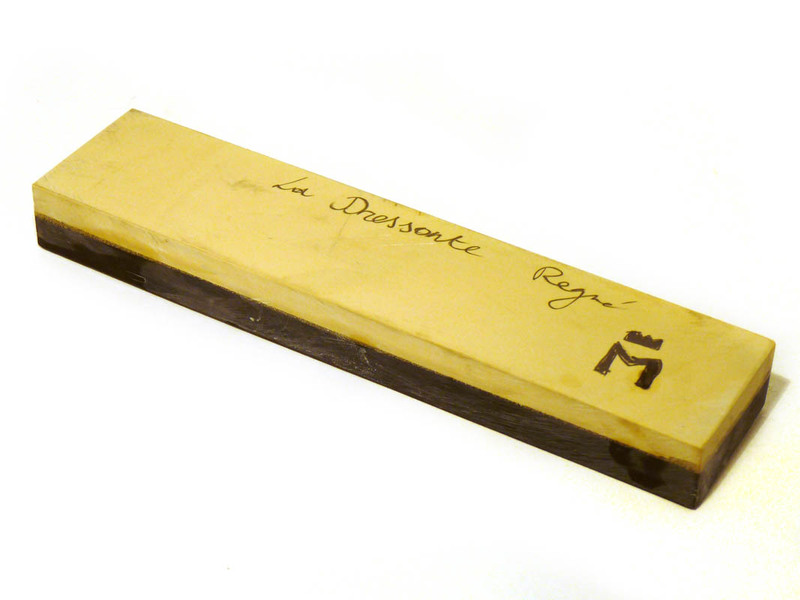 size: rectangular hone: 4cm X 17.5cm. slurry: a clear sensation of fine abrasion, typical sound of "sharpening steel" Slurry turns black after a few strokes. Slurry specifics: good slurry release, yet this hard stone requires some extra pressure while rubbing. Finishing properties, water only: excellent. Leaves a keen, slightly crispy edge. Fairly fast edge refinement. Touch-up hone, use with water: excellent touch-up properties. For the typical fineness of a Coticule, this specimen offers steady steel removal when used with water only. Additional remark: this hard Coticule works very well on razors, and is equally suited for honing other tools as well.